Rima Greer has worked as a Hollywood agent for nearly 25 years. Starting with a desk job at the William Morris Agency, Rima was offered an agent position at Writers & Artists Agency in 1984. Handling both film and television talent, she became their President of Literary from 1989-1994. 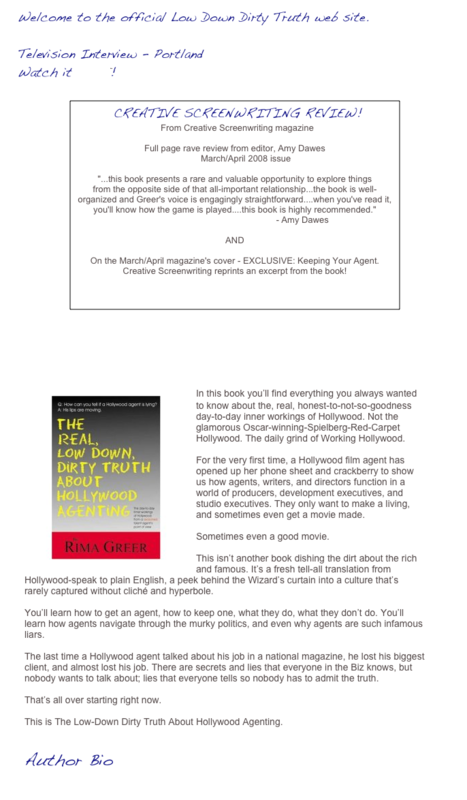 Striking out on her own, Rima started her company, Above The Line Agency, handling writers, directors, actors, and producers. She has negotiated numerous deals with Disney, Warner Bros., Fox, Universal and all the major film studios. Some of her clients’ films include “Backdraft”, “Jumanjii”, “Constantine”, “Prancer”, “Dunston Checks In”, “Charlie’s Angels”, “Pulse”, and the upcoming “Nowhereland”. She has expertise in setting up projects with foreign financing and independent distribution. Indie films she has shepherded include “The Prophecy”, “He Was a Quiet Man”, “Evil Alien Conquerors”, “Slow Burn”, and the upcoming “Poker House”, along with cable and television deals such as “Stranger in Town”, “Rescue 77”, “Merlin II” and “Category 7”. Rima has participated in a number of writers’ conferences for aspiring talent at venues such as the Writers Guild of America, UCLA, Northwestern University, and Scriptwriters Showcase. Her successful career has taken her around the globe to international film markets and festivals, as well as many exotic film locations. Rima resides in California with Scott, her husband of 19 years.